Cool 2 in 1 transforming toy, changes from a dinosaur into a blaster gun and back. All batteries included, also includes required screwdriver for taking apart the dino. Can help improve child development. Made up of over 16 pieces which are used to make the dino blaster. The Dino Blaster is part of Think Gizmos Awesome Take Apart Series. This awesome toy is not 1 but 2 toys in 1. You can either play with a toy Tyranosaurus Rex or a cool blaster gun. Everything needed to enjoy this toy is provided in the box. This includes the 3xAAA Batteries required to power the lights and sounds. Using the included screwdriver the 16 pieces of the Dino Blaster can be removed and used to transform the toy. 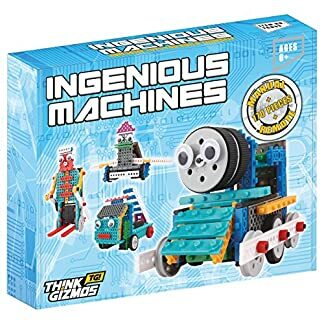 TG670 – Ingenious Machines Build Your Own RC Tank – Toy Tank Building Kit	 TG661 – Interactive World Map – Learn over 1000 facts about the world.